The GC420T is part of Zebra's economy desktop printer line providing reliable performance in low to medium volume thermal transfer printing applications. The GC420T is a direct replacement for the TLP 2844 and TLP-2844-Z series printers requiring a space-saving, desktop-size printer. The GC420T has a sturdy construction with a double-walled ABS casing and comes standard with EPL and ZPL programming languages. 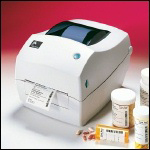 The GC420T integrates easily into a variety of printing applications, including shipping and receiving, warehouse shelf labeling and inventory control, hospitals, healthcare, and medical laboratories, transportation and logistics, and e-commerce postage. Serial, parallel, and USB interfaces make this flexible, reliable, and affordable printer a smart investment. Model GC420-100510-000, 203 DPI, 4 IPS Print Speed, 8MB DRAM, 8MB Flash, Serial, Parallel, USB, US Plug, EPL Language, ZPL Language. Model GC420-100511-000, 203 DPI, 4 IPS Print Speed, 8MB DRAM, 8MB Flash, Serial, Parallel, USB, Dispenser, US Plug, EPL Language, ZPL Language.